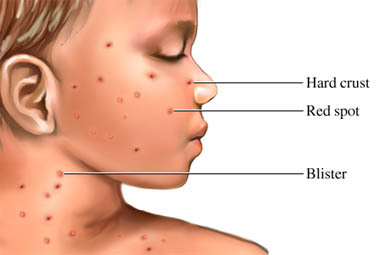 What are the risk factors for chickenpox?What are the symptoms of chickenpox?How is chickenpox diagnosed?What are the treatments for chickenpox?Are there screening tests for chickenpox?How can I reduce my risk of chickenpox?What questions should I ask my doctor?Where can I get more information about chickenpox? Chickenpox. EBSCO DynaMed Plus website. Available at: http://www.dynamed.com/topics/dmp~AN~T116084/Chickenpox. Updated June 19, 2017. Accessed March 14, 2018. Chickenpox. Family Doctor—American Academy of Family Physicians website. Available at: http://familydoctor.org/familydoctor/en/diseases-conditions/chickenpox.html. Updated January 2017. Accessed March 14, 2018. Chickenpox (varicella). Centers for Disease Control and Prevention website. Available at: http://www.cdc.gov/chickenpox. Updated June 28, 2016. Accessed March 14, 2018.